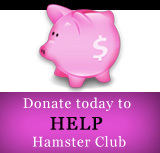 Hamster Club :: Can Hamsters eat Insects?! Did you know that you can also feed your hamster live insects? Yes! It�s true! 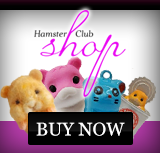 Most Hamsters love live and dried insects - one may give these as a treat. Such insects are best to be bought from pet stores that specialises in reptile feeds. 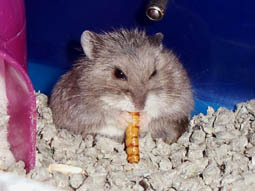 Mealworms, Super worms and Crickets are all good insects to feed your hamster as a treat. This way you are sure that these insects were had no contact with any insecticides or other dangerous chemicals. However one must keep in mind that Super worms should probably be beheaded before feeding. Feeding hamster crickets is somewhat safer to do so if your hamster is housed in a big aquarium cage so that the cricket does not escape!